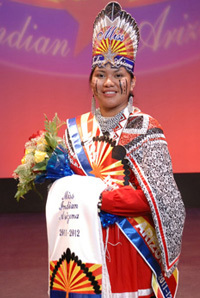 Jaymee Li Moore, from the Colorado River Indian Tribes in Parker, Arizona was crowned the 50th Miss Indian Arizona on October 8th during the 50th anniversary of the Scholarship Program. Jaymee is the 20 year old daughter of Lynette Stevens and Jonathan Moore and attends Northern Arizona University. She is working toward her Bachelor’s Degree in Political Science and Applied Indigenous Studies with an emphasis in Policy Administration.